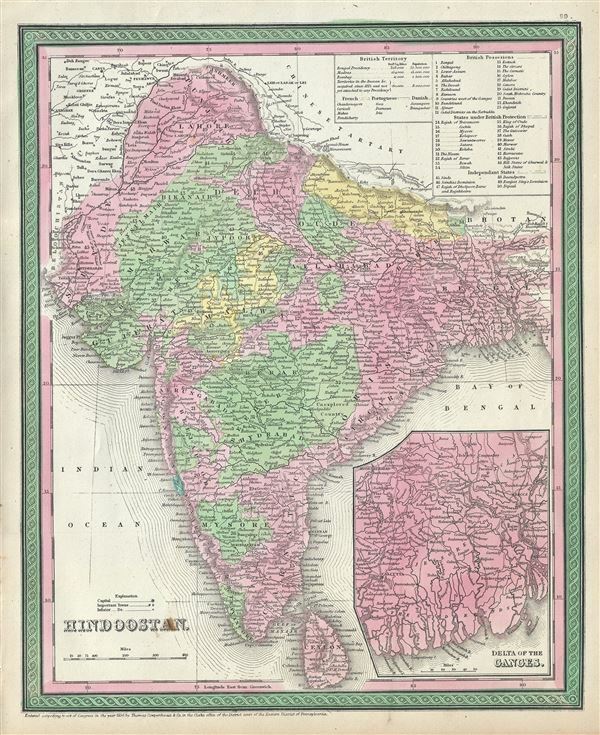 This is an attractive example of Thomas Cowperthwait and S. A. Mitchell's 1854 map of India. It covers the Indian subcontinent in considerable detail, with princely states and British possessions color coded. An inset in the lower right hand quadrant details the Delta of the Ganges River. The whole is engraved and colored in Mitchell's distinctive style with green border work and vivid pastels. Political and topographical features are noted and color coded with elevation rendered by hachure. Rumsey 3803.073. Phillips (Atlases) 809.